I can only say that the Ethereal Pear Charlotte left everyone SPEACHLESS, including myself. The presentation is #1, so nice that this time I really felt what it means to say "too beautiful to cut." I've made many beautiful things, but this time it really broke my heart to cut this. The taste was incredible, every component was well balanced. The biscuit sweetness with the tart raspberry conserve was so tender and tasty! 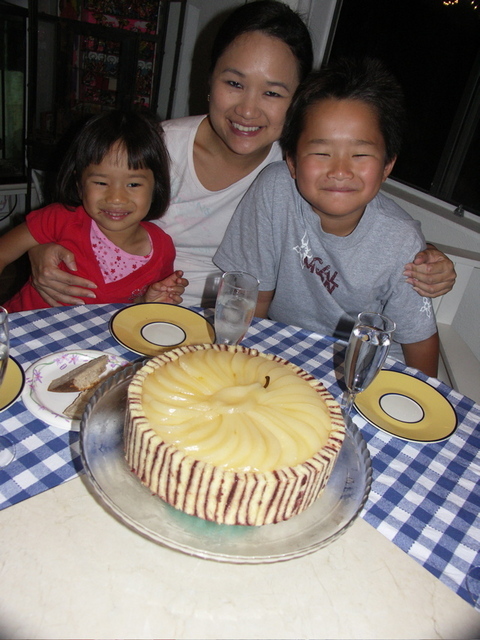 The pear bavarian cream was light, cut perfectly, you could taste the pear flavor intensely. The poached pears were such a fresh cold treat, I took pride with this because many people just use canned peaches instead. And I was really satisfied to build this on this clear glass cake stand I have, the charlotte was floating in the air like heaven. Everyone was very appreciative when taking a slice home, and I think perhaps next time, they may even bring lobster and champagne when calling the next party! This dessert makes me grow my own pear tree! You really pay tribute to pears here, thanks for designing this, took me 20 years to try it.Here is a picture of my dearest friend Deanna and her lovely kids Jade and Wilson.